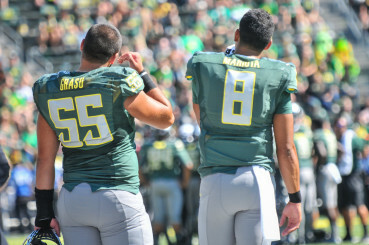 This piece is part of a project where Jason and Caleb analyze the top eight Ducks prospects for the 2015 NFL Draft. The prospects will be listed in the reverse order in which they’re projected to be drafted. Enjoy. Overview: Hroniss Grasu, simply due to lack of depth of centers in the draft, will be taken in one of the first few rounds. 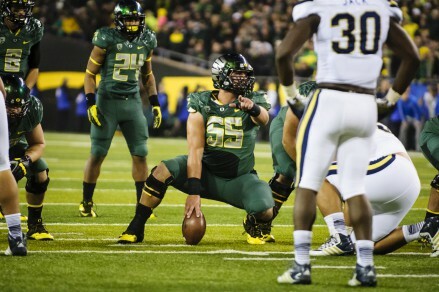 True center prospects are rare but highly coveted, and Grasu fits the bill for what many NFL teams are looking for. Somewhat lean for a center, Grasu uses his premiere athleticism to make blocks not normally seen by centers. What he lacks in strength he makes up for with a high football IQ and quick hands. Grasu was an excellent leader for a solid offensive line. Grasu was also very reliable, starting all 52 games he played in. The one asterisk for him would be that Grasu suffered a lower leg injury during his senior campaign, but it didn’t appear to hamper his play. Grasu also offers a positive attitude and a long history of leadership. 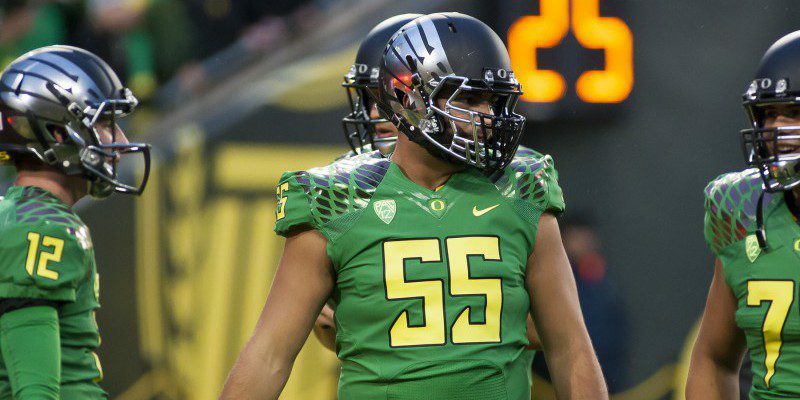 He was generally loved by his teammates at Oregon, and he was the anchor of a veteran offensive line that improved as the season progressed. Strengths: Grasu especially excels when given opportunities to display his athleticism. Whether pulling to reach an edge lineman, reaching for a second-tier block, or even adjusting quickly to pick up a pass rusher, Grasu can do it all. Despite the fact that he is slightly undersized for the position, Grasu displays mental toughness and a desire to improve. He will not hesitate to battle against bigger and stronger nose guards, often using his quick hands to beat a defender off the ball. He’s also a great locker room presence, whose dedicated work ethic will only serve to motivate those around him. Weaknesses: Size, size, size. A player’s talent can only take him so far. Grasu will play against much bigger and more athletic competition in the NFL. With a frame under 300 pounds, Grasu will be undersized against some of the NFL’s better interior defensive linemen. Grasu’s size could prove to be his Achilles’ Heel in short yardage situations, as he can fail to get proper leverage. Being undersized in the NFL will only shine a brighter light on this issue. Grasu can also overestimate his athleticism while pulling or climbing for blocks, and as a result he can be late reaching a block. One will be hard pressed to find a lineman who can reach a block better than Grasu, but because of this inconsistency, he will miss occasional blocks. These two were quite the pair. Caleb Couturie: “It’s hard to be objective about Grasu considering I’ve gotten to know him a little over the last year, and the guy is so darn likeable. He’s very polite with media, always says the right things, and appears to be widely admired by his teammates. He’s like a giant, hard-hitting teddy bear. With that said, in the trenches Grasu is nothing of the sort. Although undersized, Grasu brings an edge to him that allows him to make blocks against linemen that have up to 60 pounds on him.